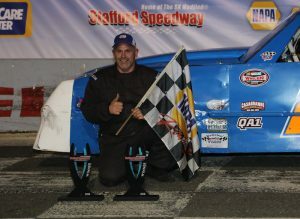 STAFFORD – Jason Lafayette held off Meghan Fuller to win the 20-lap Street Stock feature Friday at Stafford Speedway. It was the first career Street Stock victory for Lafayette, of Somers. “I don’t think it’s really sunk in,” Lafayette said. “It’s just surreal. I could see Meghan, she was catching. I think my mistake was looking in the mirror because then I started missing my rhythm. The car felt perfect. Fuller, of Auburn, Mass., was second. George Bessette Jr. of Danbury was third. Duane Provost got his second consecutive victory and third victory overall in 2018 in the 20-lap Limited Late Model feature. Division points leader Jeremy Lavoie of Windsor Locks was second and Ryan Fearn of East Longmeadow, Mass. third. Provost got by Fearn for the lead through turn one on lap 18 with Lavoie following to second place. Andrew Molleur of Shelton won the 20-lap SK Light Modified feature feature. Mikey Flynn of Hampden, Mass. was second and Bryan Narducci of Colchester third. Brian Sullivan of South Windsor won the 20-lap Wild Thing Karts Senior Outlaw feature. The shear joy of hearing a first time winner that paid his dues is special. Congratulations Jason Lafayette. Narducci once again impressive. Not for the finish so much cause he didn’t have the fastest car but for the smart race and taking what he could get. Also yea Mikey Flynn. Honorable mention for the chicks in the SK’s. Obviously most improved rookie or otherwise Amanda West. Turning improved lap times and maximizing her finishes in a ridiculously competitive field of young phenoms and grizzled veterans. Same can be said for Cassandra Cole in that beautifully prepared car she drives. Look Stafford you do what you do and never suffer second guessing from the ignorant but why? Sure you got the race in and watching the weather radar I have no idea how. The race of the wall of moisture coming at you vs the show was interesting in itself to watch. You had to know the fan turn out would be pathetic and it was. You’re at a record pace for low rain outs. Why? Not criticizing. Just wondering.